Trinity-St. John Lutheran School, a mission of Trinity and St. John's Lutheran Churches, serving our community by the grace of God. Trinity Lutheran Church, Nashville, and St. John’s Lutheran Church, New Minden, have supported Christian Day Schools since they were organized in (St. John’s in 1846; Trinity in 1886). 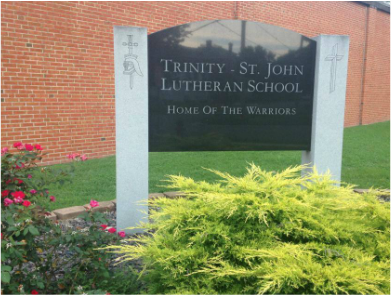 In 1974, the two congregations consolidated their schools into one: Trinity- St. John Lutheran School. God has richly blessed this union as each congregation share both the solemn responsibilities and the rich blessings of the school. This consolidation has made possible a high quality Christian education for the children of both congregations. Each congregation supports the school financially and prayerfully. They also each elect three members to sit on the Trinity-St. John Board of Education. Other board members include the pastors of the two congregations (ex- officio), the principal (advisory) and the treasurer of Trinity Lutheran Church (advisory), who serves as treasurer of the school. May God continue to bless this joint endeavor with His grace! To assist parents, both members of Trinity and St. John’s and other interested parents, in the Christian training of their children. Parents, after all, are the most important Christian teachers their children will ever have, and God himself charges: “Fathers, do not exasperate your children; instead, bring them up in the training and instruction of the Lord.” Ephesians 6:4. As an arm of Trinity and St. John’s congregations, to carry out the mandate of Christ to His Church: “Make disciples of all nations, baptizing them…and teaching them to obey everything I have commanded you,” Matthew 28: 19-20; which mandate is followed by His promise: “Surely I will be with you always, to the very end of the age” Matthew 28:20. To lead our students to see all of life from the perspective of Christ and His inerrant word—including all subject areas, all activities in the daily routine, all interpersonal relationships, and every calling of life and society. To train children for responsible and active participation in worship and congregational life. To bring home, church, and school together so that our children may grow intellectually, physically, spiritually, and socially, as Jesus did: “Jesus grew in wisdom and stature, and in favor with God and men,” Luke 2:52. To lead our children in a Christian life of wisdom, freedom, and happiness on earth; and ultimately, to receive God’s free gift of eternal life in heaven. To provide opportunity for families to be brought, by the Spirit’s power, into eternal life-giving fellowship with Christ. Trinity-St. John Lutheran School is fully recognized as a Nonpublic School by the Illinois State Board of Education. Recognition was received during the 2017-2018 school year and is renewed annually. Trinity-St. John Lutheran School does not and shall not discriminate on the basis of race, color, religion (creed), gender, age, national origin (ancestry), disability, marital status, or military status, in any of its activities or operations. These activities include, but are not limited to, hiring and firing of staff, selection of volunteers and vendors, and provision of services. We are committed to providing a Christian and welcoming environment for all members of our staff, students, families and volunteers.